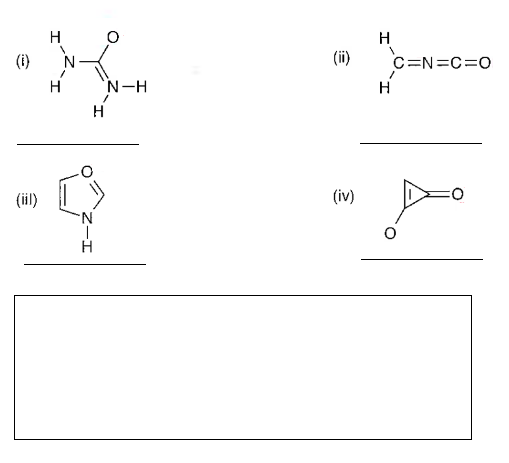 Solution: Complete the valence - bond structure below by adding any necessary non-bonding (lone pair) electrons. Also, show any formal charges other than zero (0), then on the line describe the overall shape of the molecules (i-iv) above. Consider only carbon, nitrogen and oxygen for the overall shape. Use "linear", "planar", or "tetrehedral" to describe the shapes. In the box, show a resonance form of the compound (i) above (non- bonding electron and formal charges). Complete the valence - bond structure below by adding any necessary non-bonding (lone pair) electrons. Also, show any formal charges other than zero (0), then on the line describe the overall shape of the molecules (i-iv) above. Consider only carbon, nitrogen and oxygen for the overall shape. Use "linear", "planar", or "tetrehedral" to describe the shapes. In the box, show a resonance form of the compound (i) above (non- bonding electron and formal charges).